No sooner will the Cultivate Food Festival be moving into autumn when another great food growing event comes alive! Capital Growth has organised this London-wide garden open day to showcase the diverse and delicious community food growing scene in the city, and to give newcomers a chance to learn how to get involved in their local garden. “September is peak harvest season so it’s the perfect month to check out what’s happening in your neighbourhood’s gardens. We’ve got loads going on, from garden fresh cob oven pizza parties, to fresh apple pressing, to preserving & pickling workshops. It’s all free and perfect for family outings,”says Maddie Guerlain from Capital Growth. One garden taking part is Wildcat Wilderness in Catford, who will be baking bread on a campfire, showing visitors how to make chutneys and jams and teaching people about beekeeping. During the evening they’ll host a community BBQ and lantern evening. Over in Bethnal Green, Cranbrook Community Garden will have a grow-your-own workshop for families, followed by a healthy eating cooking demonstration and harvest-themed performance from a local community choir. They’ll wrap the evening up with a multi-cultural meal in the garden, with local residents sharing food from their own countries. Capital Growth’s flagship allotment garden in The Regent’s Park will host their annual Harvest Feast which always attracts hundreds of visitors. They’ll be serving pizza baked in the cob oven and topped with garden veggies, running children’s growing activities and pressing their own apples for juice, all accompanied by live music. The events are being organised as part of London Food Link’s Urban Food Fortnight, which celebrates the ultra-local food being grown, cooked, made and saved on London’s doorstep and runs from 9-25 September. 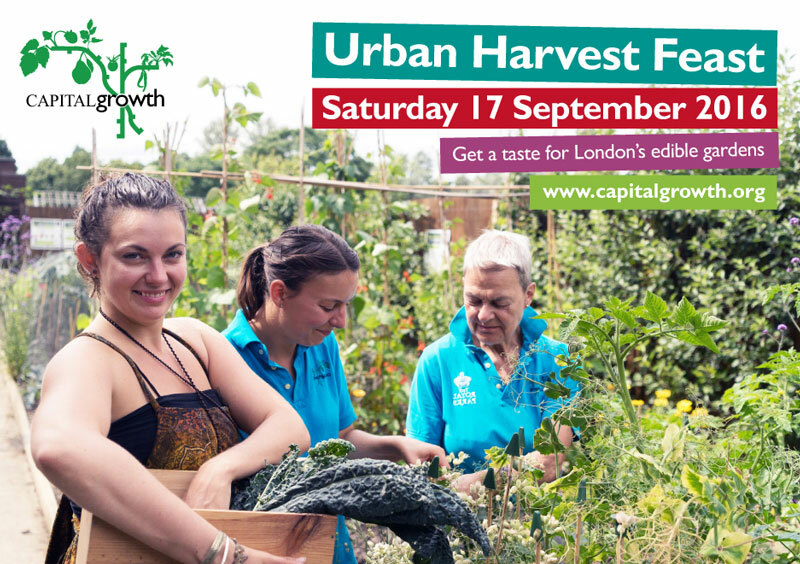 The Urban Harvest Feast is a part of Capital Growth’s London Grows initiative, which aims to help over 2,000 people get involved in volunteering at their local community growing projects, learn about wildlife-friendly growing, and improve London’s green environment.